The women of Wales were left behind to look after their families when their men went to war, and some might have joined the Land Army or done other war work, some may have been nurses, and others joined the Women’s Army Auxiliary Corps – the WAACs. Some may have served with the Welsh troops at Bedford, and certainly in Bedfordshire at large. Williams, Head Cook Annie of the Women’s Army Auxiliary Corps (WAAC’s), from Ammanford, was home on leave from Biggleswade, Bedfordshire, reported the Amman Valley Chronicle of 18 July 1918, her family, it said, being one of the most patriotic in the Valley, and listing at the bottom of the first column of Ammanford news the family members who had served. Butterworth, Sister Assistant Matron at the VAD hospital in Ampthill Road, who took part in the ceremony of the chairing of the bard at the Easter Monday Eisteddfod, placing the laurel chaplet on the chaired bard’s head (can we assume that as a participant in the ceremony she will have been Welsh?). 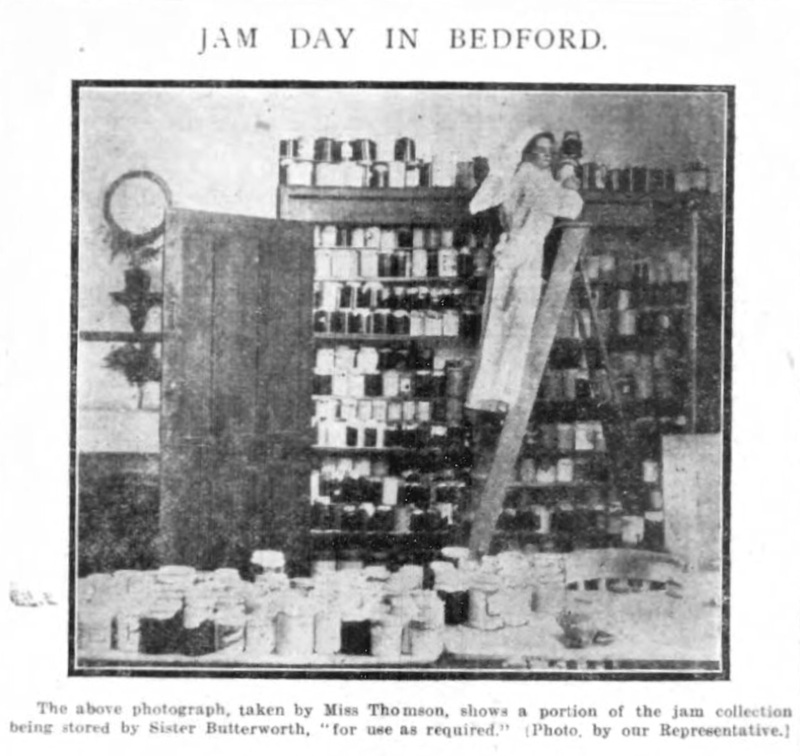 Sister Butterworth is shown in photograph below from the 6 October 1916 edition of the Bedfordshire Times and Independent which reported on the successful culmination on Saturday, 30 September of a special effort to collect pots of jam for the hospital.